During my first visit to Nashville nearly 12 years ago, I could sense it in my bones that this city was on the cusp of becoming the “it” city. I can’t say what exactly spoke to me. It was just a feeling that I couldn’t shake. When I returned home from my visit, I decided some how, some way, I was going to move to Nashville. Even if it meant sacrificing my proximity to the ocean and becoming landlocked. Fast forward six months and I was loading up a Ryder truck and hauling my stuff to Music City USA. Fast forward again to 2013 and Nashville was dubbed “The IT City” by The New York Times. Like most people who visit Nashville, I became enchanted with everything my senses could absorb. The grittiness of those determined to pursue their musical dreams. The friendly folks always willing to help out a stranger. The energy of creativity afloat in the fields of technology, entertainment, and art. And the always delicious southern cuisine. At the time right before my move, I was working as a college career adviser in North Carolina. I leveraged my network in the field of higher education to secure a job in the career center at the prestigious Vanderbilt University. I also snatched up some real estate before everyone else figured out just how great this city is. And boy, am I glad I did considering the city’s current housing costs and shortages. Everyone’s moving here, and I can’t blame them for wanting to! Since moving to Nashville, I’ve had experiences I never dreamed I’d have. I left higher education to start my own business and named it after my new town — paNASH (a play on the French word “panache” and the name “Nashville,” just in case you didn’t get that). I’ve had the opportunity to get to know celebrities as the real people they are outside of the smoke and mirrors of fame. I began the best relationship of my life, with Jesus. I became a two-time published author and #1 Amazon bestselling author. I got to serve with a local church on a mission trip to the remote jungles of the Amazon. I discovered my passion for standup paddle boarding. I made some beautiful friendships, gained a new lease on life, and discovered my 40s are way better than my 20s and 30s ever were! There are so many people I meet on a regular basis who also felt the lure of the Nashville vibe and couldn’t stay away from here. So for the 70+ new people moving here EVERY DAY and the millions who visit here each year, welcome! Here are a few of my favorite Nashville things I want to share with you! Aside from not having to pay state income tax, the biggest perk of living in Nashville is getting to have the best of both worlds in terms of city life and country living. Only 10–15 miles outside of town are beautiful rolling hills and picturesque lakes with wooded hiking trails, sprawling horse farms, and beautifully manicured golf courses. In the heart of downtown Nashville you’ll find a Grammy award-winning symphony, restaurants headed by world-renowned chefs, fine art museums, headquarters for various multi-national companies, and professional hockey, football, and soon-to-be major league soccer teams. While I have too many favorite music venues here in Nashville to name, if I have to pick just one it’s the historic Ryman Auditorium, AKA the mother church of country music. It’s where the Grand Ole Opry began and is now host to some of the world’s greatest musicians and recording artists. I’ve had the opportunity to experience the goose-pimpling acoustics of this national treasure while attending the ASCAP awards and performances by The Civil Wars, Lyle Lovett, and even my favorite comedian Brian Regan. After the shows it’s an easy 13 steps across the alley to the world famous Tootsie’s Orchid Lounge for more great live music. Located downtown next to the Nashville Entrepreneur Center and housed in an old trolley barn, Pinewood Social is buzzing with heads of tech startups, freelancers, and entrepreneurs meeting over lunch to discuss work. But it also provides some time for play with a swimming pool, bocce court, bowling alley, and private karaoke lounge. The Nashville CEC offers a plethora of personal and professional enrichment courses at affordable prices (some are even free!). Classes include songwriting and other arts, foreign languages, cooking, career and finances, technology, and more. I’ve both taught and taken classes with the Nashville CEC. I’ve taken a financial success class and a copyright law class, and am registered to take a Kung Fu/Self-Defense class this spring. 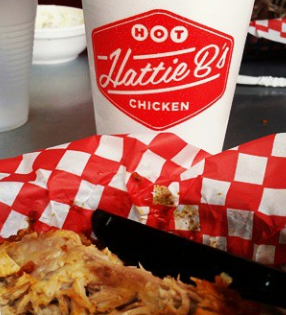 While all the Nashville hot chicken joints are good, Hattie B’s on Charlotte Pike is my favorite. You can also find Hattie B’s in midtown near Music Row. If you go, be prepared to stand in line, and know that it’s worth the wait! Vince Gill is the nicest and most humble man, not just in country music, but in music in general. While far from being an attention-seeker, he always has a friendly word to everyone at the Belmont basketball and Ensworth High School football games I frequently see him at. This Nashville fur resident has 6 million Facebook followers and 3 million Instagram followers. Doug the Pug also has his own bestselling book and recently did a book tour in the UK. His daily posts and regular visits to the Vanderbilt Children’s Hospital bring smiles and laughs to so many faces. Though he may not be the best role model for keeping my new year’s resolutions, I can’t help but love him and his jolly rolls! I’m SO excited about this new place located close to me in Belle Meade! It’s a Melbourne-inspired coffee house owned by an Aussie couple who, like me, fell in love with Nashville and decided to move here. It reminds me of my time I spent in Australia about 15 years ago. Their Avo Mash avocado toast topped with a poached egg is to die for. AND they have delicious hot chocolate made with Nutella (another one of my favorite things!). I can’t wait to try everything else they have to offer! I first discovered stand up paddling here in Nashville when I went to Paddle Up Nashville for a beginner lesson. I was hooked from the first moment! It’s the closest thing to walking on water, and it’s so much fun and great exercise. It wasn’t long before I stopped renting a board from Paddle Up and bought my own race board from them. The owner was very knowledgeable about what kind of equipment would work best for me personally. Paddle Up has so many fun activities like full moon paddles, mileage builders, and Thirsty Thursdays. They even had a solar eclipse paddle this past August. There was nothing like staring up at the sky and experiencing totality while laying on my board and floating in the middle of the river. Nashville is the perfect place to do flatwater stand up paddling. Paddle season lasts from about March through October and sometimes even into November because of Nashville’s mild temperatures. Plus, we don’t have alligators or sharks in our water! Click here for my interview with Paddle Up owner Neil Newton. After a day of paddling I often like to walk down the ramp from Paddle Up to Blue Moon Waterfront Grille for a drink or some appetizers. They have one of the largest patios with one of the most beautiful views of the river and the marina. And of course this being Nashville, there’s often live music going on. Boaters will dock right next to the restaurant while making a stop on their voyage down the Cumberland. It’s a nice little unexpected place off the beaten path. There are so many hiking trails in and around the Nashville area, but Edwin Warner Park is my favorite. Especially since it’s only a mile from my house and also connects to neighboring Percy Warner Park and the Harpeth Greenway. There are miles of both wooded and paved hiking trails that transport you to a serene wildlife sanctuary. I never tire of seeing deer, owls, and other beautiful animals. Most people don’t know there’s access from the bike trails at Shelby Bottoms Park to the Cornelia Fort Airpark, named after the first female pilot to die on war duty in American history. Even fewer people know this small airport was the one where Patsy Cline’s plane was supposed land had it not tragically crashed in 1963. 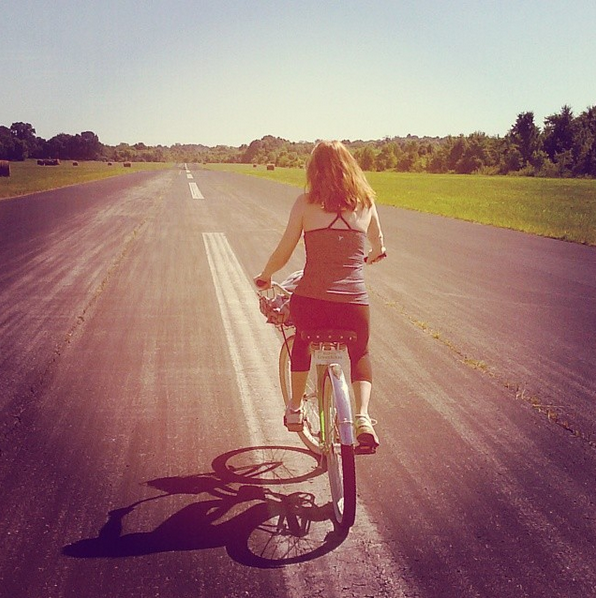 Here I can actually ride my bike on the airstrip where planes like hers used to land and take off. You won’t find any “gentrified” home cooking recipes here. Just good ole southern comfort food made with love by Barbara herself. Located just outside of historic downtown Franklin, Barbara’s Home Cookin’ is like going to eat Sunday dinner at my grandma’s house. But I never know who I’ll run into there. I’ve seen Clint Black and Lisa Hartman-Black, Olympic gold medalist Scott Hamilton, Mark Slaughter, founder of the heavy metal band Slaughter, and more. Barbara’s is the area’s best kept secret. Their food is even better than the famous Loveless Cafe, but without the two-hour wait. Anyone who knows me well knows I’m a big college basketball fan, specifically ACC basketball. Even more specifically Carolina Tarheel basketball. But since I’m too far away from NC, I get my college basketball fix from the Belmont University Bruins. I always enjoy visiting Belmont, whether it’s for a program I’m doing for the students, visiting colleagues, or attending one of the games. The atmosphere of the games is so much fun, and with Coach Rick Byrd at the helm, you can always expect excellence from each player. I have yet to find a hamburger as good as the ones back home from The Shake Shop, but a close second are the burgers from The Pharmacy in eclectic East Nashville. Their shady beer garden patio makes the burgers taste even better! And the only time I ever drink soft drinks is when I’m at The Pharmacy. They make their own old fashioned sodas that contain no caffeine, no preservatives, and no corn syrup. The orange creamsicle is my the best! Forget the chintzy souvenir shops in downtown Nashville where everything there is made in China. 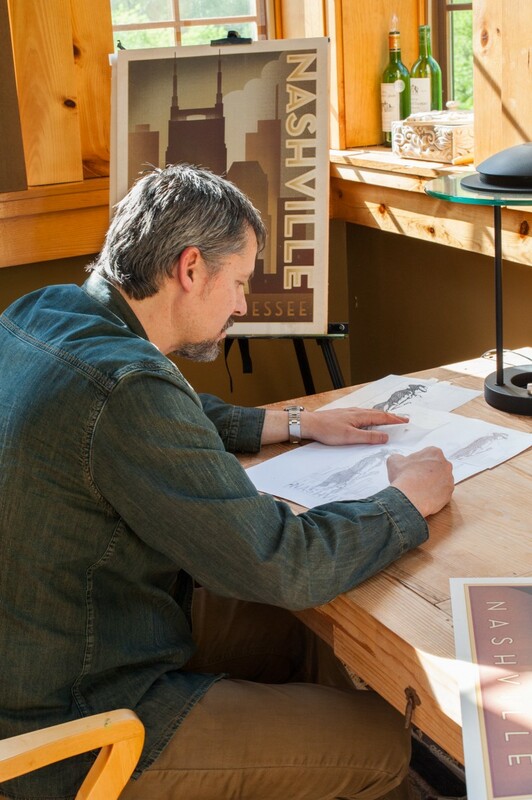 For something authentically Nashville-made, visit Anderson Design Group Studio Store. Located right next to Centennial Park and The Parthenon, here I can buy original “Spirit of Nashville” artwork by the studio’s owner Joel Anderson. Click here for my interview with artist Joel Anderson. I can also find unique local products and gifts with packaging and branding designed by Joel and his team. Merchandise includes Bonga Java coffee beans, Olive & Sinclair chocolate, and more! I stumbled upon this sophisticated yet quaint restaurant and wine bar in Sylvan Park while trying to find the perfect place to celebrate my birthday with friends. We all loved Park Cafe so much. The wine was good, the food was even better, and they have great happy hour specials on their tapas-style dishes and their drinks. They were so kind to put us in a private room for my birthday celebration when I didn’t even ask for one. Top-drawer service! Whenever I really need some quiet time to think, I like to take a drive down the Natchez Trace Parkway. This 444-mile scenic parkway starts in Nashville and cuts through the beautiful terrain in Tennessee, Alabama, and Mississippi leading to the Gulf coast. I often stop along the way for a view of the Natchez Trace Bridge or for a walk along some of the nearby hiking trails. My bucket list includes working my way all the way down the entire parkway and making stops at all the historical sites and bed-and-breakfasts. While I enjoy all Nashville has to offer residents like me, there are times I need a change of scenery. And like for most Nashvillians, the best get-away is to the South Walton beaches in the Destin, Florida area, specifically Scenic Highway 30-A. Emerald waters, white sand, sunshine, and scrumptious fresh seafood. What more could a girl need to recharge? paNASH Passion & Career Coaching has been named one of the top 10 Nashville coaching services for the past two years in a row by Expertise.com. Subscribe to the paNASH newsletter and receive a complimentary 8-Step Goal-Achievement Plan. paNASH offers a coaching track just for those new or moving to Nashville to help them make a smooth transition and successfully integrate into the Nashville community. To get started, complete the paNASH intake form and Lori will schedule you for a complimentary consultation. paNASH is Celebrating Its 10-Year Anniversary! Ten years ago today, I walked into the Davidson County Clerk’s office to get a business license for paNASH. I had no idea what I was doing since I’d never started a business before. It was scary to say the least. But, I put one foot in front of the other, filled out the form, and paid my fee. When I walked out I thought to myself, “Okay, this is real now. I have to do it.” My business license was more than just a little piece of paper. It was something tangible that was holding me accountable. I started working hard on my business part-time while still working full-time. Nine months later I took a leap of faith and quit my cushy career advising job with benefits to pursue my business full-time. paNASH originally began as an image consulting business working primarily with up-and-coming recording artists here in Nashville. I used my skills from my previous experience as a college career adviser to teach new artists how to present themselves in media interviews, to labels, and more. The additional wardrobe styling piece of the business served as a creative outlet for me at the time. But after eight years, I started feeling restless in my business and it no longer felt right to me. I couldn’t yet put my finger on why, but I knew it was about to undergo some big changes. I loved working for myself and knew I didn’t want that to change, but I was burned out on the original concept of the business. And, I’d become extremely frustrated with the way the music industry works. I loved my clients, but I was done with the constant frustrations. I didn’t know it at the time, but I was being called back to what I loved most and was best at, career coaching. Only this time, it was taking on a new approach. For the full story, read From Fashionista to Passionista. Since making the change to my business nearly two years ago, I’ve been much happier. It thrills me to see my clients gain the confidence to pursue their own passions that have been lying dormant for so many years. Although they face a series of common challenges while going through the process of pursuing their passions, they start to sense an excitement in the transition to a new life and career. They have a light in their eyes again. And while I’m also happier, I still face some challenges in my own transition of the focus and mission of my business. One of those is still being thought of as an image consultant. I guess I did a really good job of establishing paNASH’s brand early on. Too good of a job! When you Google paNASH, there are still some things that pop up indicating image consulting. I’ve had to turn away several people seeking image consulting services. But, I’m using the same branding strategy now that I did then to eventually replace my former brand. And it’s working. Just like it works for my new clients whom I’m teaching how to develop their own personal brand for their career and their lives. To boldly pursue my passions and purpose, and to teach, encourage, and inspire others to do the same, resulting in lives overflowing with joy, peace, and fulfillment. This mission statement helps me to make better decisions regarding both my business and my personal life. To serve, educate, and encourage you by assisting you with the discovery and pursuit of your passions in a way that honors your purpose and your own vision for success, while amplifying who you are personally and advancing you professionally. No matter what your goals are, I encourage you to also develop your own mission statement. To learn how, check out my on-demand program on personal branding (45% of proceeds go to Justice & Mercy International). You’ll be glad you did because once you’ve completed the program, you’ll be able to make better life and career decisions. Decisions that are true to your unique passions! paNASH is seeking a social media intern who can assist with social media and social marketing efforts. Specifically, we are seeking someone who is well-versed in social media advertising, especially Facebook advertising. The ideal intern will be able to work independently with the ability to work from home much of the time, but will also receive regular guidance, feedback, and instruction. He or she will also have access to occasional complimentary career coaching for his or her own professional and career development at no charge. The successful intern may also earn a small commission from the business he or she brings in through his or her social media advertising efforts. Facebook advertising: create target audiences, help determine what type of ads to promote, and create ads (opportunity to earn a commission for business generated from ads). Occasional LinkedIn advertisement/opportunity to learn LinkedIn advertisement. Promote paNASH’s on-demand programs and one-on-one coaching services via social media. Help re-evaluate paNASH’s social media presence and make suggestions for improvement. Maintain each of paNASH’s social media accounts, including Pinterest and LinkedIn. Promote weekly blog posts via social media. Assist with writing and/or editing weekly blog posts. Must be enrolled in an accredited university and registered to earn academic credit for the internship. Experience in creating Facebook ads and proficient knowledge of Facebook Ads Manager and Audience Insights required. Experience in creating LinkedIn ads preferred but not required. Proven ability to leverage various social media platforms for marketing purposes. Good grammar and written communication skills required. paNASH is a Nashville-based career coaching service that focuses on helping people discover and pursue their passions through their work. We work primarily with people currently going through career transitions (i.e. post-grad job search, career change, downsize/lay-off, leaving corporate to start their own business, etc.). paNASH’s ideal clients are those with a creative and teachable spirit needing encouragement and a strategy to step out of their comfort zone and overcome their fear of change. We work with people who feel stuck in or are fed up with the rat race and want to do something more authentically-related to their passions and purpose in life. Send a cover letter and resume with past examples of proven ability to lorib@yourpassioninlife.com. Deadline to apply is November 15th. Position begins at the beginning of the spring semester. As I’ve previously mentioned, I recently had eye surgery. When I first was told I’d need the surgery, I assumed that, even though it was “surgery-surgery” as opposed to a simple laser procedure, it wouldn’t be a big deal. After all, it was out-patient surgery. Boy was I wrong! Because of how quickly I had to have the surgery, I had no time to do any real research on what I’d be going through. That’s probably a good thing because if I’d known what I know now, I probably would’ve chickened out, and therefore ended up losing my sight in my right eye. I’ve been so confused as to why my healing period is taking so long. But the more medical staff I speak to, all of them tell me the same thing: “you just went through a big surgery.” Not only have I gone through a “big surgery,” I’ve also experienced some minor complications from the surgery, making healing time longer and more challenging. The most challenging part of recovery (aside from the pain and not being able to drive) has been my sensitivity to sunlight. I love being outside when it’s sunny and the weather’s nice. I don’t like the dark. This is why I always choose doing something outside over going to a movie during the day. But, I’ve had to spend weeks on end sitting inside with the blinds closed. This has brought me down mentally and emotionally, especially on the days when we’ve had 80 temps in February! But just the other day, I received something that lifted my spirits. I’m very honored by this distinction, and it’s made me use this time to reflect on what makes my coaching business paNASH unique from other great coaching services. paNASH provides a “hybrid” approach. While I’m a certified coach, my background is in career advising. Therefore, I strike a balance between challenge and support. Traditional career coaching focuses only on asking you questions. My hybrid approach provides both challenging questioning to help you arrive at the answers that are within you, along with realistic career advice based on my knowledge and extensive past work experience. paNASH provides unique and cutting-edge career advice. Much of the job search advice found on the Internet is the same advice from nearly 20 years ago. I know because it’s the advice I was giving to my clients all the way back in 1999. I love staying abreast of the latest career strategies. In addition to the tried and true advice, I strive to provide unique and cutting-edge advice others aren’t currently providing. This makes you stand out (in a good way!) from other candidates who are only applying outdated job search strategies. paNASH encourages you to think outside the box. I love helping you unleash your creativity when it comes to your career and your life. I’ll help you see other options you’ve never previously considered that are different from a traditional path. This can lead to both personal and professional freedom, which you’ve probably been seeking for some time now. paNASH understands the importance of personal reflection and experience. I could give you numerous career assessments, and sometimes do without overwhelming you. But you’ll never know if something is a fit for you until you’ve spent time in self-reflection to figure out your “why” and in trying new things. paNASH provides you the permission and the space to explore your passions and to figure out your purpose. Assessments are great at telling you what you’re good at, but they can’t tell you what you really want. Only you can answer that question when given a safe place (away from societal and/or family pressures) to ponder and consider what feeds your soul. paNASH likes to get moving! Because of my own passion for the outdoors, I’ve been known to hold coaching sessions outside and even on the water. It’s not unusual when the weather is nice for me to take you out for a walk or hike, or even a paddle on my spare standup paddle board. The results have been so beneficial because clients have commented on just how rejuvenating the experience is. It’s helped them gain clarity on their current situation, adopt a fresh perspective, and even confirm for them what their next steps should be. Plus, they got a little exercise, and most of all, had fun! So, if you’re ready to get started with paNASH, take the first step by completing the paNASH intake form. Now that I’m finally on the mend and spring is nearing, I’m anxious to get moving again and to help you get motivated!